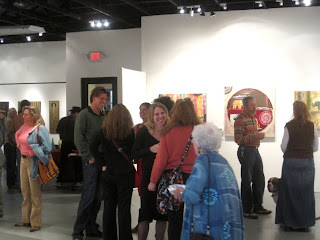 A great opening reception and a new feature on our website! Artists Lindsay Ahl, Katey Cooper, Harry Pollitt and Paul Chandler opened their exhibit, "Views of the Sacred" last night. The opening was attended by more than 150 people. While we didn't see anyone physically dancing, we did see people entranced, lost in thought, animated and gesturing, and having a great time. This show, while varied in both style and media, has an intimate feel. The art works invite the viewer to engage and to contemplate. Congratulations to Katey Cooper who had the first sale of the show. Views of the Sacred will run through November 13. Gallery hours are Fridays and Saturdays from 12 pm to 6 pm. In an effort to more fully engage both artists and the community at large in the art on display at the La Tienda Exhibit Space, we are starting a new page on our site for public reviews. Be the first person to review this show and help us create a forum for an honest discussion of art. Opening Reception: Saturday, October 16, 2010 5:00 - 8:00 p.m.
You want the real thing? 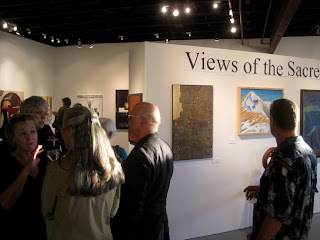 Views of the Sacred is a show that asks you to penetrate the superficial and experience the profound. Harry Pollitt’s work provides the g-force, Katey Cooper’s vision expands from the minutest cell to the cosmos, Paul Chandler’s landscapes speak to the untamable within us all, and Lindsay Ahl’s philosophy and elephants offer a way into the mystic. Views of the Sacred is a show that explores ancient patterns, places and icons, and demonstrates that the more we understand, the deeper the mystery reverberates. Asking fundamental questions without glitter, these artists share an appreciation of majesty. From the expansiveness of a landscape to the minuteness of an individual cell, from the sinuous curves of wood carved and polished to the rough hewn elephant in a world evoked through iconography and imagination, this show is derived from the natural world and provides viewers the opportunity to meditate on their lives with fresh vision and a new lens. These works are, in many ways, about our experience through space and the passage of time. Every moment opens onto the timeless. These works invite the viewer to slip through. Ahl, Chandler, Cooper and Pollitt offer a view of the sacred: the worlds of worlds inside each cell; the way the time is always now. Hors d’oeuvre’s will be served, naturally. Dancing and intelligent conversation will be expected. 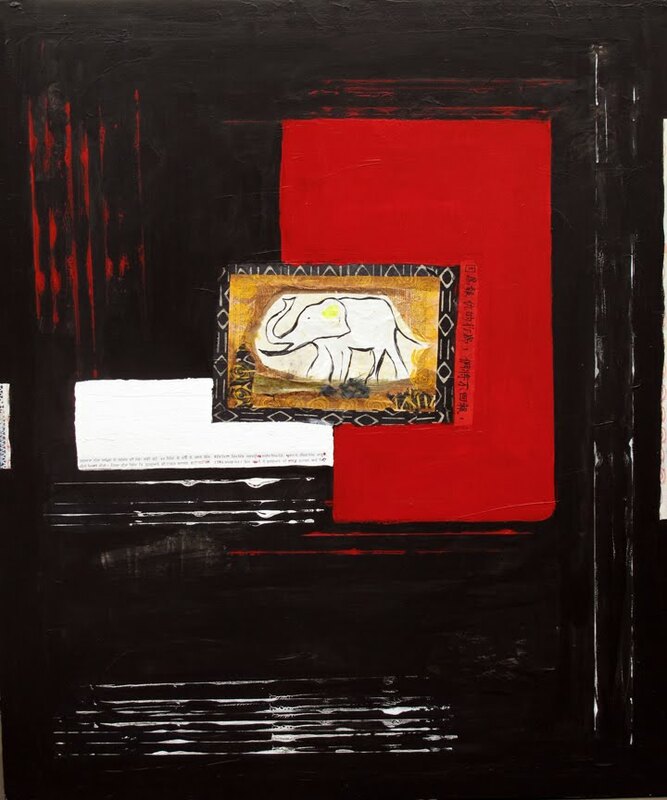 LINDSAY AHL spent some time in Africa as a child, and her experiences there inspired a body of work that explores the icon of the elephant. Elephants are known for their long-term memory and their ability to communicate with each other from 50 miles away using low sound waves. Like all of nature that once seemed indomitable, the elephant is currently threatened. This work celebrates that which appears solid but becomes the ephemeris; like the present moment, knowing it is unique, and soon gone. 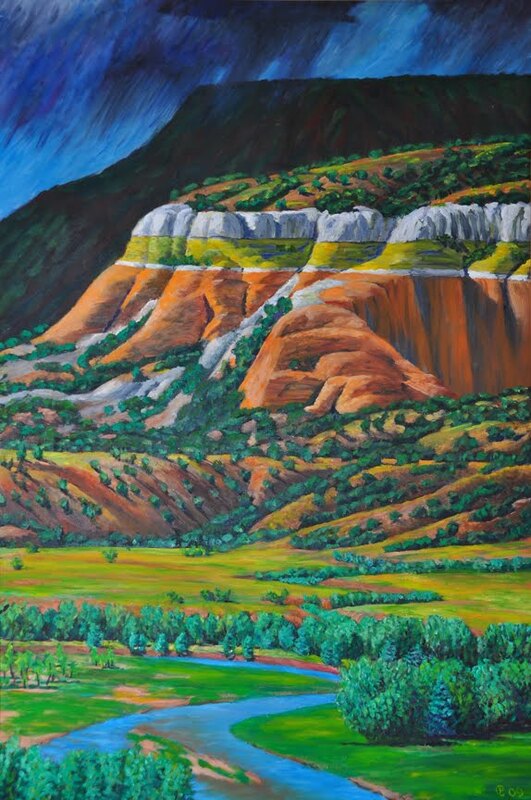 While hiking (or skiing) extensively around the southwest, PAUL CHANDLER creates plein air pastel drawings that he then uses to create oil paintings. Paul began his career as a sculptor, in both ceramic and metal -- and with his oil paintings he focuses on implied volumes and spatial dynamics in his landscapes. His work explores the ancient and sacred nature of wilderness and illuminates its beauty. Both his pastel studies and oil paintings will be featured at the show. KATEY COOPER’S work in gold leaf points both towards the microscopic and the astronomic, the dual viewpoint of the lens of a microscope, or the eyes of one gazing at a night sky. Her work explores the fundamental link between the microcosm and the macrocosm, that is “what is contained in all life (cells) and that which contains all life (the universe).” She uses gold leaf, with its inherent luminosity and reflectivity, as a metaphor for soul and thought. In creating his sinuous, free form wood sculptures, HARRY POLLITT is always in search of the “perfect set of interconnected curved lines and planes,” rekindling his experiences of tracing the whirling grain patterns of his schoolboy desk or of the exhilaration triggered by tight-turn g-forces while hitching a ride in a military fighter. Pollitt seeks rhythm yet unpredictability, juxtaposing forces of positive and negative space that draws the viewer round and into the forms. ART WALK CALL: La Tienda is looking for Mixed Media Artists for the next Art Walk. The Art Walk will open on December 7 and coincide with the La Tienda anniversary party. 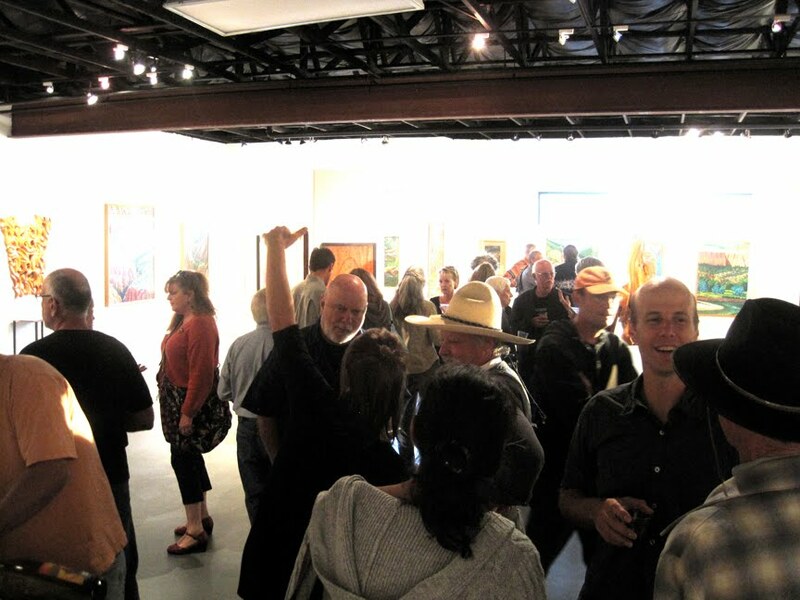 This is a great opportunity to display your work in front of a very large crowd. La Tienda has purchased and is in the process of installing appropriate lighting in the hallways so the art work is properly lit.